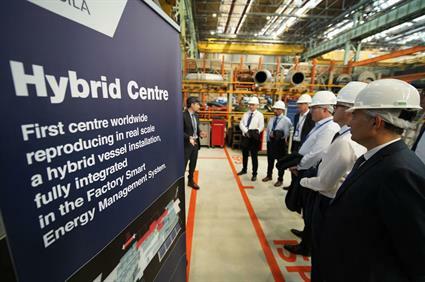 It was four years ago that Giulio Tirelli, Director of Sales and Business Intelligence at Marine Power Solutions Wärtsilä, came up with the idea of setting up a hybrid centre. “There were many rounds of discussion, planning, receiving approvals, and arranging for finance,” says Tirelli. After that, it took a year to finally commission the project. Why? Well, because nobody had attempted something like this before. This was going to be a first-of-its-kind project: a real-scale hybrid centre that would provide possibilities to simulate operational data from the field, develop, validate and further optimise Wärtsilä’s innovative HY power module. Wärtsilä HY is the industry’s first hybrid power module that combines engines, energy storage system, and power electronics optimised to work together through a newly developed energy management system, the “brain” of the HY power module. The HY power module has one of the most advanced level of integration for hybrid technology in marine applications and is the new technological benchmark for hybrid propulsion systems given its clear economic, operational and environmental benefits. The centre was finally commissioned in September 2018 and the official inauguration took place a month after. 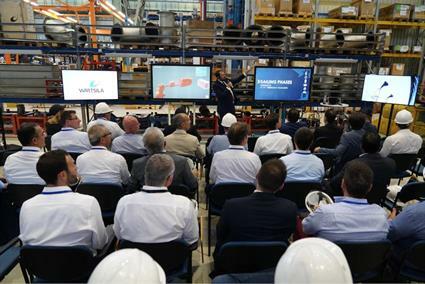 The facility, located in Wärtsilä’s factory in Trieste, Italy, comprises a 2 MW diesel engine, batteries, power drives, a propeller load simulator using an electric motor, a power take-off/in motor generator, and the overall energy management system. “Around 10–15 experts will be stationed at the centre, specialising in different areas such as electric systems, data analysis, performance and batteries. Wärtsilä is already looking into future developments where we could integrate even other sources of energy,” says Tirelli. The aim of the centre is also to train the customers’ crew and provide a hands-on experience to the technicians. On top of this, it will familiarise owners and operators to the Wärtsilä HY. One of the goals of the Wärtsilä hybrid centre is to provide a hands-on experience to the technicians. The centre’s primary objective is to provide a first-hand experience of the hybrid technology to various customers. “We actually want to co-create and further develop the hybrid technology together with our customers, to come across and satisfy their specific needs, providing high-end value,” says Stefano Furlan, one of the people responsible for building and running the centre. “We want them to try out the hybrid model and feel the difference between the present systems and the future ones,” explains Furlan. The first such opportunity came right after the day of the inauguration, on 18 October 2018. During the HY UP! event more than 120 Customers, from 80 different countries, came to visit the new facility. “These were a good mix of people representing shipyards, companies operating ocean cruisers, ferries, tugs, dredgers, off-shore platforms and even sports yachts,” says Tirelli. During the event, they witnessed the first real-life demonstration of the new hybrid technology at the centre and were familiarised with the components of the HY power module. “The feedback was positive. We have already planned for future meetings with these customers,” says Tirelli. “Customers could translate the potential of Wartsila HY into their vessels and systems that could bring real benefits according to their different segment operations,” adds Furlan. One of the biggest drivers of making the hybrid technology more accessible and popular is the strive to increase the sustainability of the marine sector. The centre has already tested Wärtsilä’s patented electric start-up procedure to deliver a smokeless start of the main engine. “This is one of the biggest innovations ever in the medium-speed diesel/gas engine the marine market has seen. This was ever tested before and gave us one of the most interesting outcomes. It was impressive to see how a diesel engine could start up without the ‘typical’ black smoke coming out from the chimney,” explains Furlan. According to Furlan, the key here would be optimising the energy usage. “For instance, we have an electric start for large and medium-sized engines. This not only reduces fuel consumption but also leads to a massive reduction in diesel smoke and particulate matter,” he explains. Another such example is the start/stop functionality which also helps in optimising fuel consumption. “The fuel-consumption figures depend very much on the vessel type, operation, way the crew operates, etc. However, for certain offshore vessel the fuel saving could rise up to 15–18%,” says Furlan. Here, fuel is not the only savings. “Maintenance costs will also inherently reduce since the components will be less stressed and less used compared to a traditional system,” explains Furlan. “We have put in practice something that other companies have only been talking about,” says Tirelli. However, he is not afraid that the competitors might copy their technology. “They are welcome to follow. After all, sustainability and saving our planet is a common goal,” he says. The hybrid centre itself is also a good example of successful integration, improving the sustainability of the factory in Trieste. The energy generated by the centre will be fed to the factory grid to provide sustainable power to the company’s production facilities. “Through all our activities we want to stress the need for achieving sustainability and set a benchmark. As a company, this is one of our main goals,” says Furlan. An event for 120 customers from all over the world can accumulate a lot of non-biodegradable trash, even if it means getting them together for a few hours. So, Wärtsilä decided to cut down. “We decided to go green for the event. Just by using traditional glass cups we saved over 1000 plastic cups,” says Tirelli. No plastic bags, no paper cups, no flyers, no printed invitations or distribution materials were used for the event. To avoid printed material, presentations and brochures, event programmes, dinner invitation etc., were distributed digitally. The gadgets were made of recycled materials and candles were used instead of flowers for the gala dinner. Even the badge holders were made of recycled material and then reused as a nametag for the luggage. “The event was about marine sustainability and focused on reducing the amount of waste. So, it was an obvious decision and our guests really appreciated it,” says Furlan.